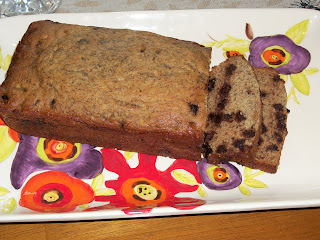 I love the chocolate chip banana coffee cake at Starbucks, and have been wanting to try and recreate it. I came across this recipe the other day which is very similar. I used Hershey's Special Dark chocolate chips, which make anything good. It was pretty close, I just should have added some chocolate chips to the top before baking. I didn't think about it until it was half way done. Mix wet ingredients together: bananas, sugar, applesauce, egg, vanilla. Mix dry ingredients together: both types of flour, baking soda, baking powder. Slowly mix dry ingredients with wet ingredients. Once mixed well, scraping bowl to make sure everything is incorporated, mix in the chocolate chips (I used 3/4 cups). Pour mixture into greased loaf pan, and bake at 350 degrees for about 45 - 50 mins. I put a piece of foil over the bread for the first 35 mins and then removed for the remaining 15 mins to make sure the bread didn't get too brown. YUM!!! I MUST MAKE THIS!! I can't believe this is low fat! Exciting!